Charring lemons give the dressing to this vegetarian summer salad a whole new depth. 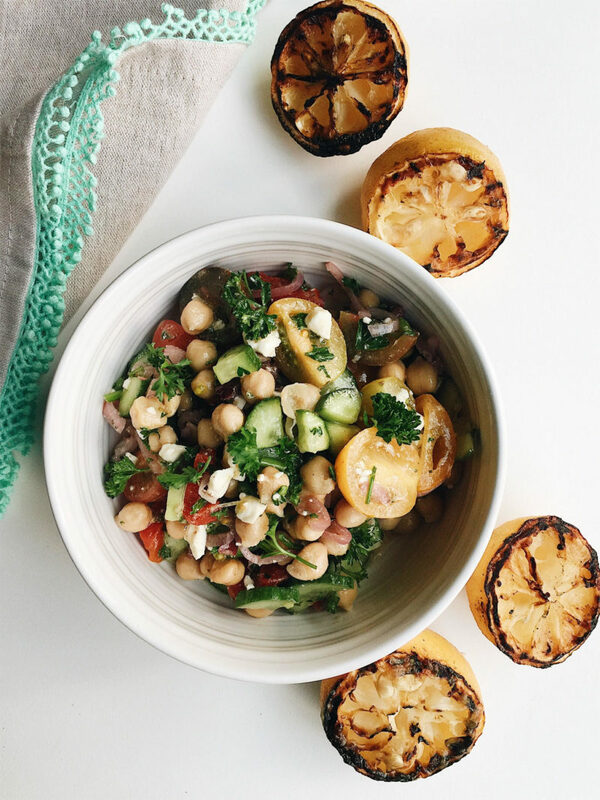 This Grilled Lemon Chickpea Salad is the perfect BBQ or picnic accompaniment: loaded with fresh vegetables, salty feta, pickled shallots, protein-packed garbanzo beans, and bright citrus. 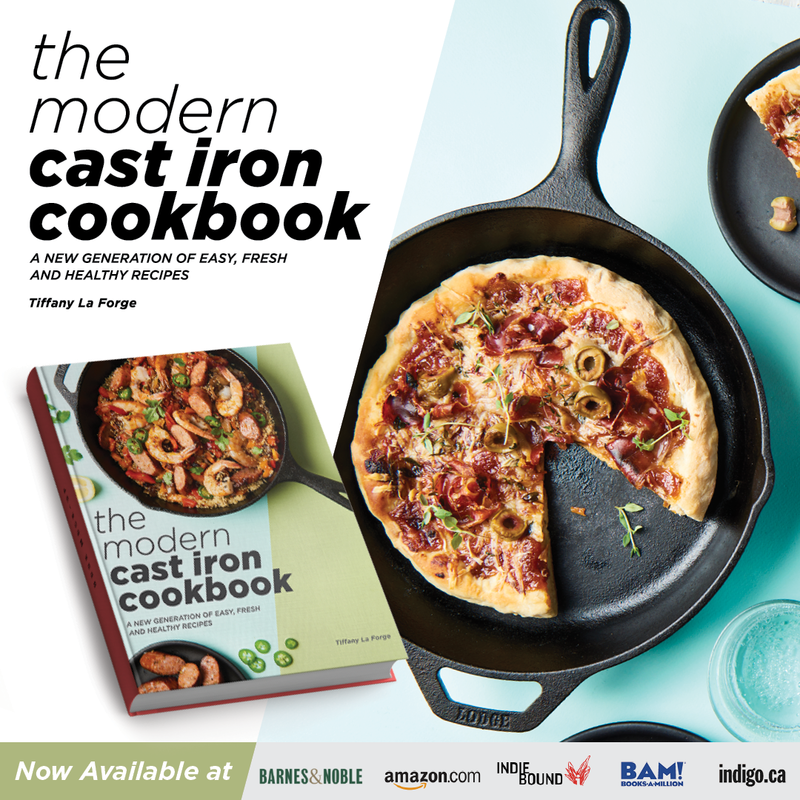 While I appreciate a great potato or macaroni salad, I really love including some more unique additions to a summer BBQ. 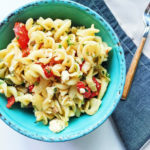 A spin on pasta salad with Roasted Fennel Pasta Salad. 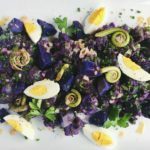 A seasonal Purple Potato Salad with Fiddlehead Ferns. 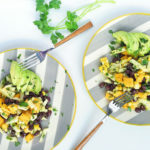 A sweet-and-savory Mint, Olive, and Watermelon Salad or a refreshing Mango, Black Bean, and Grilled Corn Salad. The sides are actually always my favorite part about a BBQ. Well, that, and the beer. 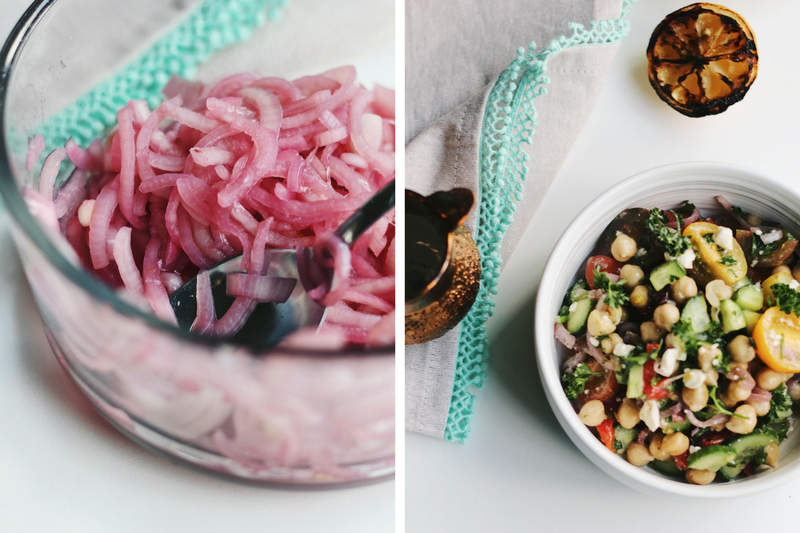 This Grilled Lemon Chickpea Salad with Pickled Shallots is definitely one side that I would gravitate to at a summer shindig. 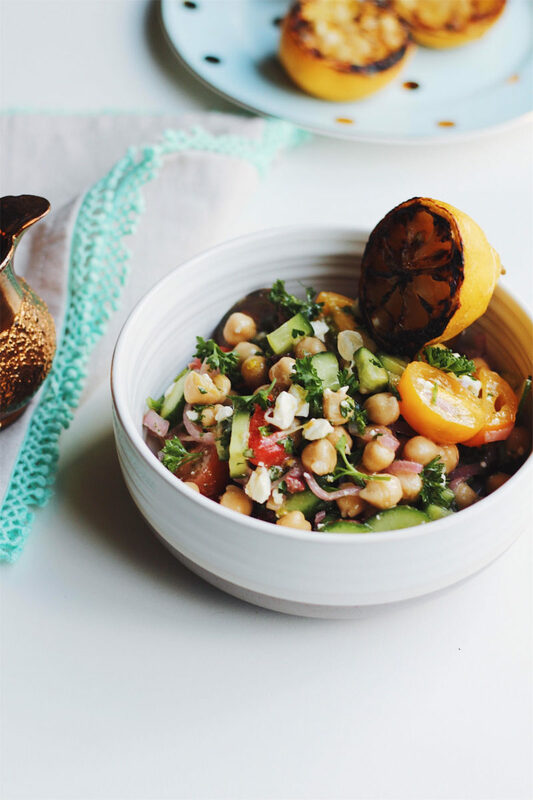 This Grilled Lemon Chickpea Salad takes a bit of inspiration from classic Greek flavor combinations. There’s zesty lemon, salty feta, fresh parsley, Kalamata olives, and roasted red peppers. 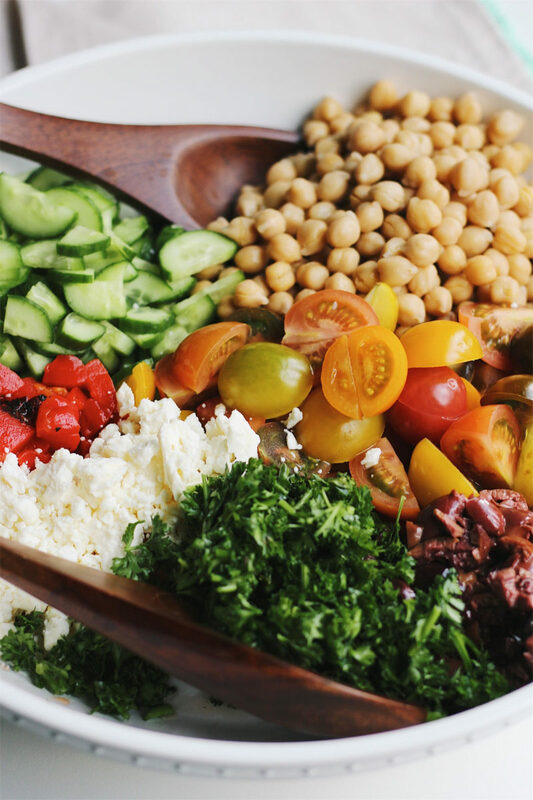 Chickpeas are the base of the salad. 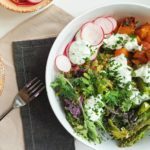 I love using chickpeas in hearty sides and salads. They’re not only inexpensive, but they pack a huge fiber and protein punch. Mini heirloom tomatoes add a burst of color and Persian cucumbers add plenty of crunch. Quick-pickled shallots, pickled in red wine and rice vinegar, give balance to the dish. I love anything pickled, particularly in salads or antipasto platters, and even more so in the summer. The star of the show here? Lemon. But, not any lemon, no. 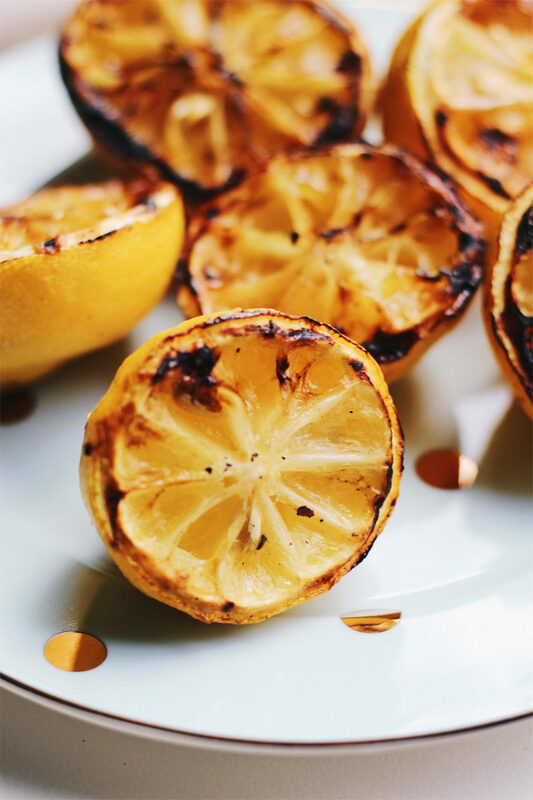 Grilling the lemons take just a few minutes and lead to a deeper citrus flavor with a slight char. It’s delicious when turned into a vinaigrette. To do this, a gas grill that is small or medium in size will work just fine (plus, they’re more portable and lightweight, great for bringing along on picnics!). 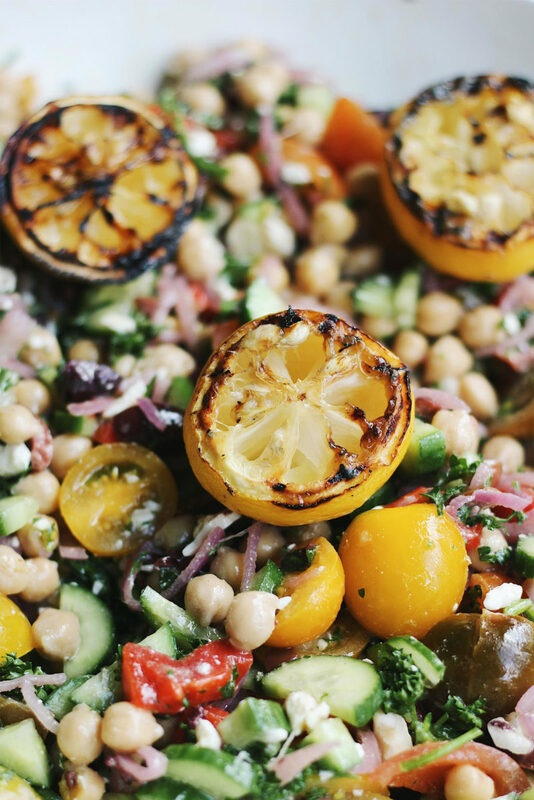 The punchy flavors of this Grilled Lemon Chickpea Salad makes it the perfect summer salad. Not to mention, it just looks really pretty, too. 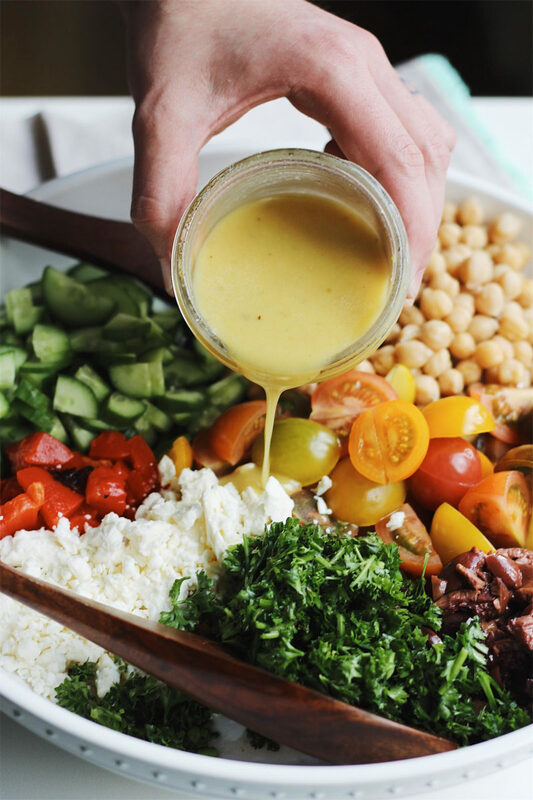 I hope you enjoy this Grilled Lemon Chickpea Salad, and maybe bring it to your next BBQ! 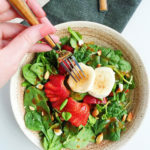 What’s your favorite go-to summer salad? Let me know in the comments below! 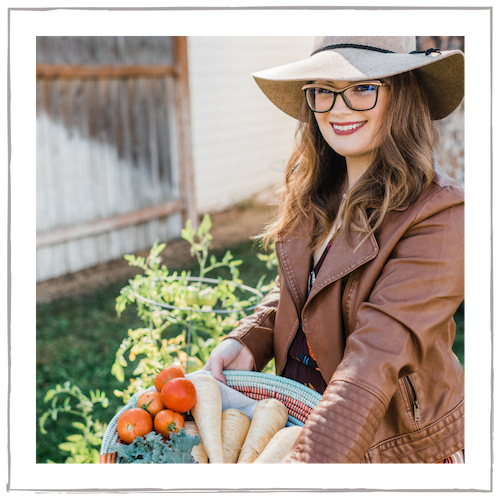 This post contains affiliate links, but are always products I love & highly recommend! Charring lemons give the dressing to this vegetarian summer salad a whole new depth. 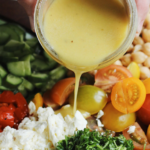 This Grilled Lemon Chickpea Salad is the perfect healthy and unique BBQ side dish. Combine the vinegar, sugar, salt, and red wine in a small saucepan and bring to a simmer. Add in the thinly sliced shallots and simmer one minute. Remove from heat. Let the mixture cool to room temperature and sit for about an hour. Strain the shallots. Cut the lemons in half cross-wise and brush the cut sides with olive oil and a sprinkle of salt. Grill the lemons over medium-high heat until heated through and charred, about 3 minutes. Squeeze the lemons (discarding the seeds) to measure a 1/4 cup of lemon juice. This should be about 2 or so lemons. Keep the additional grilled lemons for garnish. In a mason jar, combine the lemon juice with the olive oil, Dijon mustard, honey, oregano, and sea salt and pepper to taste. Shake well until combined. 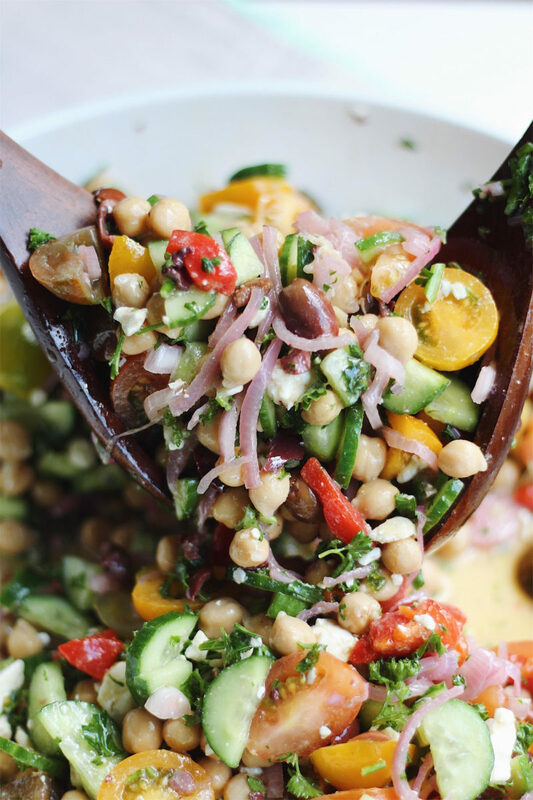 Combine the rinsed and drained chickpeas with the drained pickled shallots, cucumbers, tomatoes, feta, olives, roasted red peppers, and parsley. 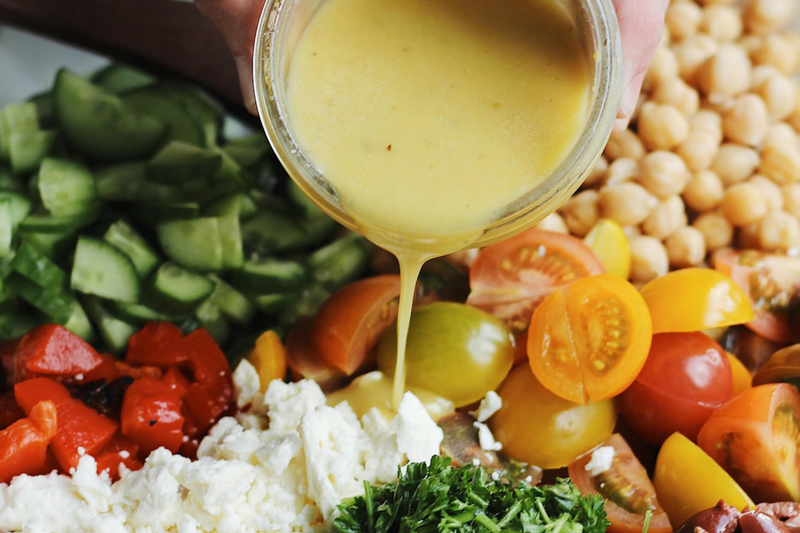 Pour over the vinaigrette and toss everything until combined. Serve the salad with the additional grilled lemon as garnish. 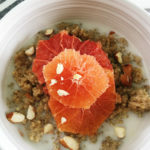 Serve the salad immediately or chill in the fridge and allow to marinade overnight to deepen and balance the flavors. These photos are amazing! I want to hang some of these on my walls haha. I really really enjoy your salad recipes. Healthy has never looked so appetizing, and your salads are always so flavorful and bright. Thanks for sharing! I wish I had this salad for lunch right now! It looks so delicious. Can’t wait to try that dressing! Love giving a char to my lemons, it definitely brings a different dynamic to a dish! Charring the lemons is so exciting.Need to try this way. 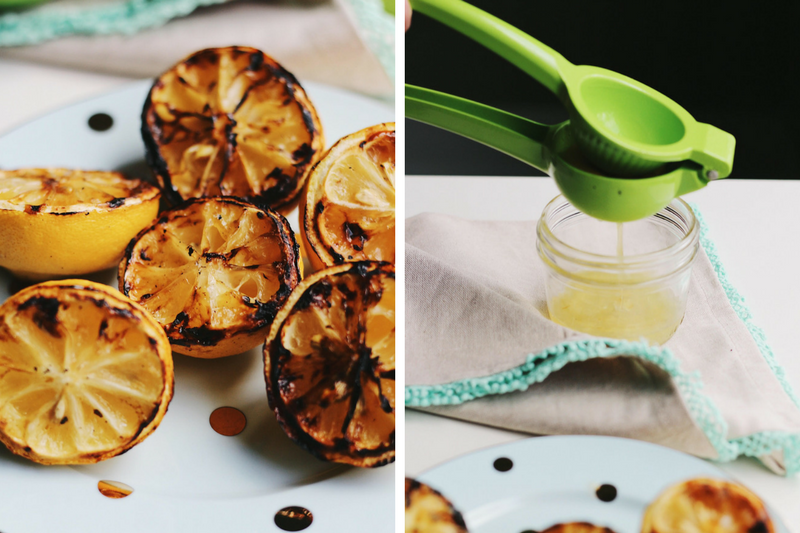 What an incredible idea to char the lemons…I bet they add so much flavor.